Hello! I’ve had this buffet for a few years now. I liked it, but after a while I got tired of it being so dark. I wanted something lighter. 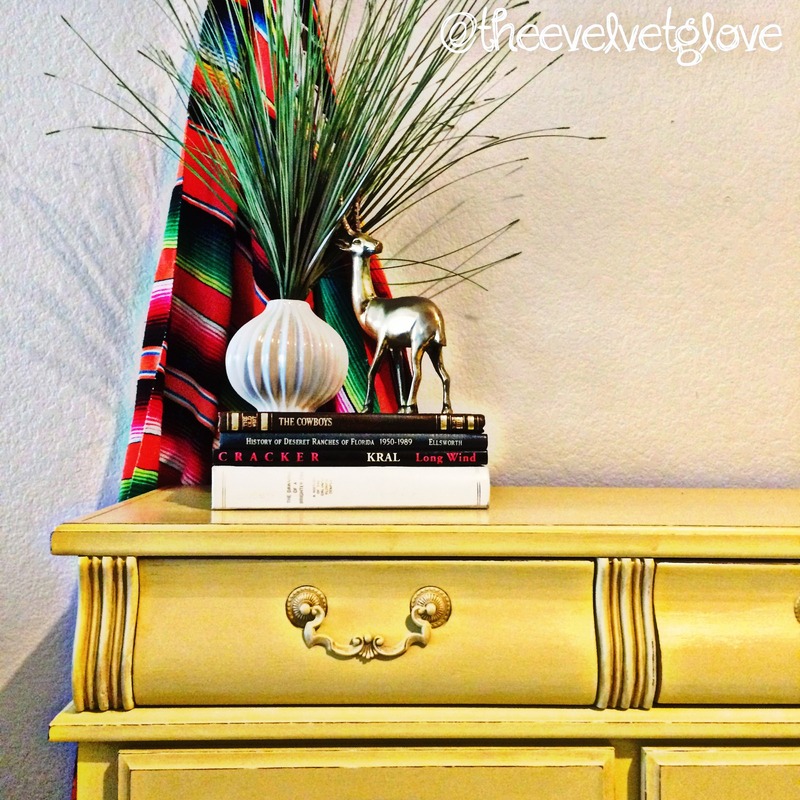 After much thought I decided on this fabulous, rich, buttery yellow, Buttercup Chalk Type Paint from the Vintiques line by Heirloom Traditions. I started with a layer of Chantilly Chalk Type Paint, a classic, bright white, then sanded lightly with 220 grit sandpaper and painted on a layer of Buttercup. This paint has great coverage. It only took one coat of each color. I added a layer of Clear Spray Wax in the crevices and brushed on some Aging Powder in Ancient Agings, which gave it a really cool subtle but aged look. You’ve gotta try that stuff! 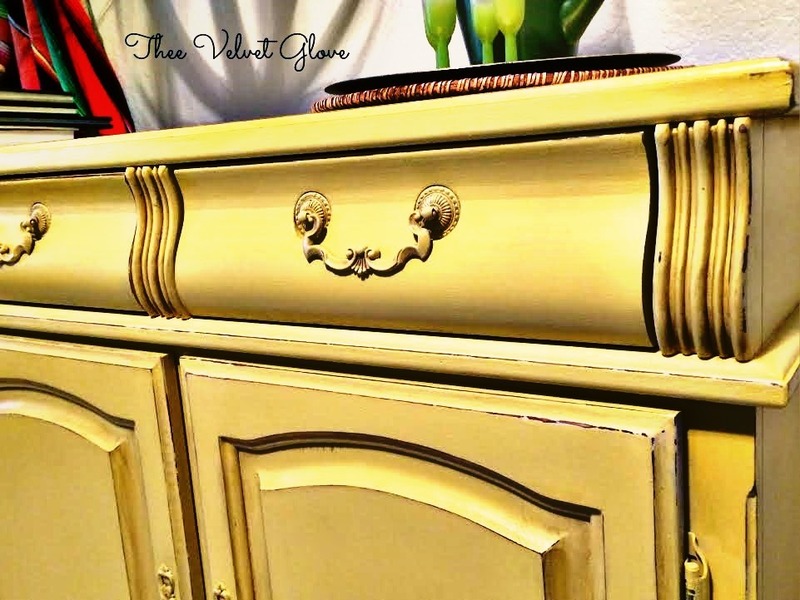 To finish it off, I distressed and then sealed with Vintiques Satin Topcoat, a water based top coat that gives your painted finish long lasting durability & scrubility! This top coat is unique because it is specially formulated to be able to adhere to a waxed surface. 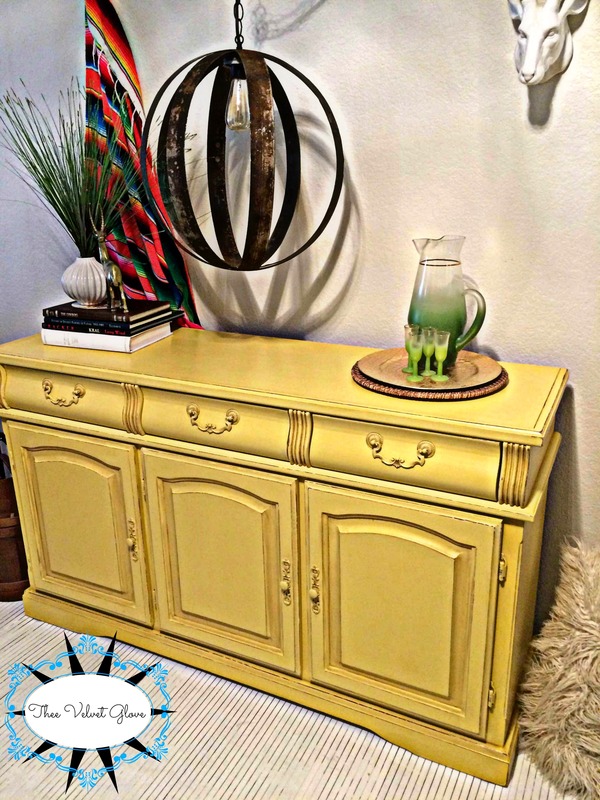 This means you can still antique your piece with wax, if that’s the look you desire, but be able to give your painted furniture a durable finish. Low VOC’s, safe to use indoors & safe to use on baby furniture. Love it and the packaging is just adorable! It’s available in 3 sheens: Matte, Satin and Gloss. 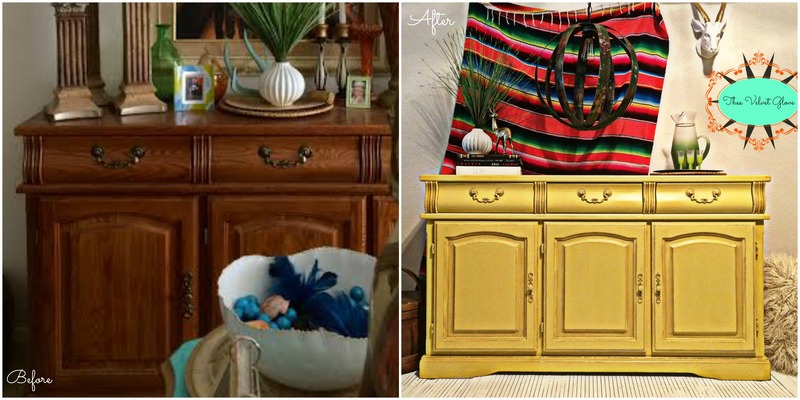 For more information on Vintiques products click here. 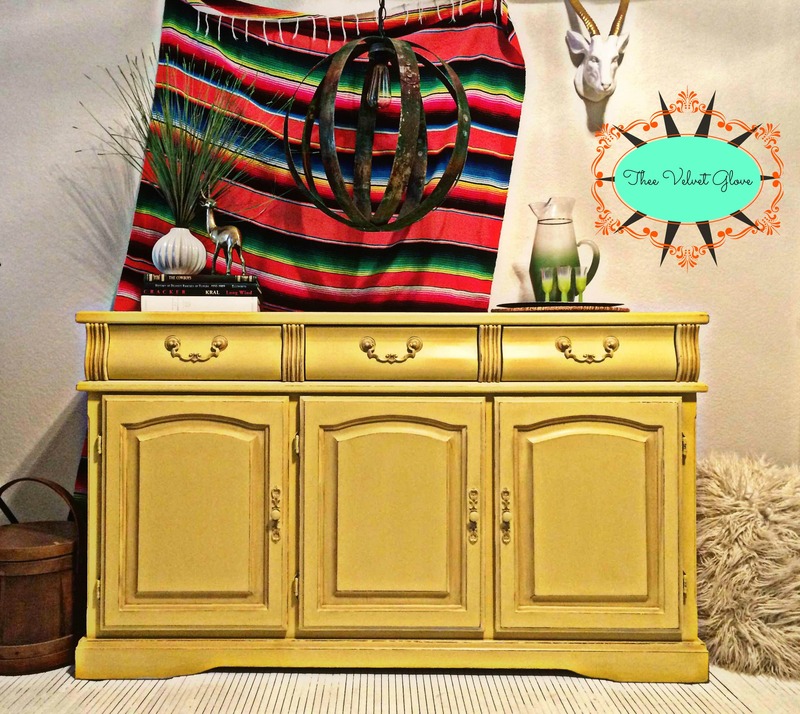 This entry was posted in Before and After, Buffet/Sideboard, Heirloom Traditions Chalk Type Paint, Uncategorized and tagged before and after, distressed, furniture, Heirloom Traditions, heirloom traditions chalk type paint, painted furniture, yellow by theevelvetglove. Bookmark the permalink. I saw this piece before and really didn’t give it a second glance. NOW – WOW!!! 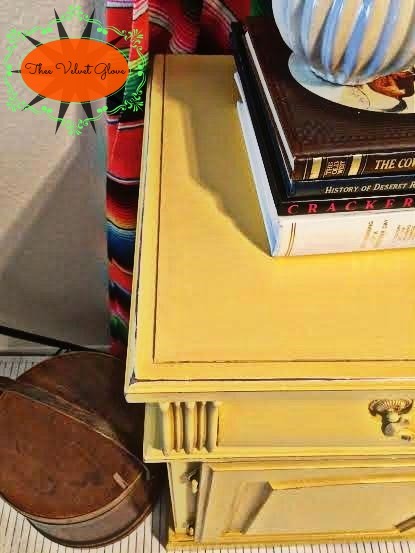 Once again you succeeded in changing my mind about a color family…I LOATHE yellow. I mean, it makes me kinda queasy. And yet, in your hands, it becomes this buttery, soft, appealing shade of sunshine. Stop it right now, please, or I’ll have to re-think my entire aesthetic! Hahaha Heather! Yes! Thank you so much for your comments. I love hearing from you. I love the black chair you just did too! So pretty! What a lovely, lovely redo!! That color!!!!!!!!! LOVE!!!! 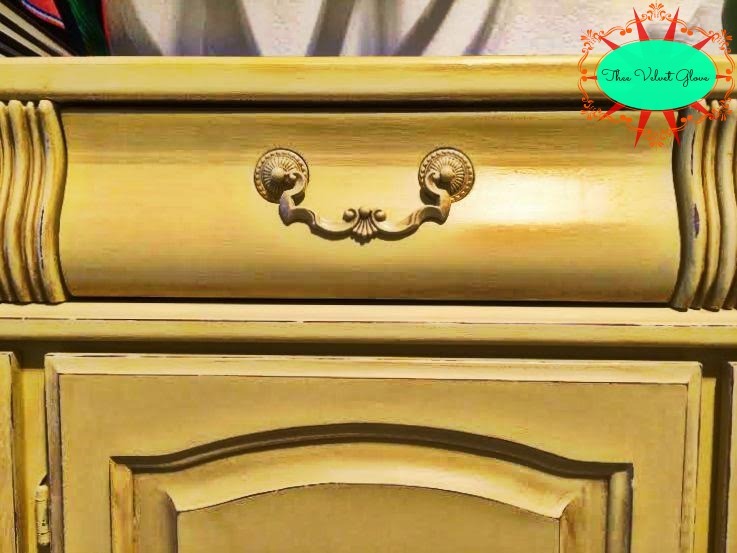 Looking forward to seeing more of your fine refinished pieces. Wow. To be honest i would have never chosen that colour. I’m a play it safe kinda girl but you chose well and did a great job with it!